Break spaghetti in half, and cook as package directs to al dente stage; drain and rinse with cool water; set aside. 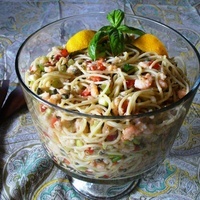 In large bowl combine spaghetti, shrimp, celery, onions, bell pepper, and capers. In medium mixing bowl whisk together oil, lemon juice, vinegar, garlic, lemon pepper, celery seed, sugar, salt and red pepper flakes (optional). Drizzle over spaghetti, shrimp & veggies, and toss lightly to coat. Adjust seasonings as needed. Chill one hour or more before serving. I love pasta salads!...especially with new dressings. I like the dressing make over in this salad. I can't wait to try this, the addition of capers has my curiosity piqued. Another pasta recipe that i will add to learn and try. Thank you!